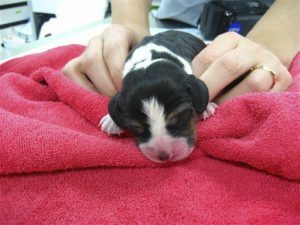 South Koreans aren’t noted for their love of dogs (at least not in way we would interpret ‘love’) and some South Korean scientists have further pushed the boundaries on how we perceive their relationship with their canines by genetically modifying some puppies to glow in the dark. 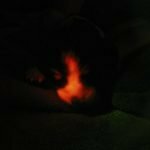 You might be wondering what use is a puppy that glows in the dark, other than perhaps the obvious novelty factor, or the ease of finding them if you let them off the lead at night. Well, the scientists who created these ‘glowing dogs’ claim that they’ll be invaluable in helping to cure diseases, as well as being handy novelty night-lights. The glowing dogs are all clones, and are all named Ruppy (which has very cleverly been made by combining the words ruby and, yes you guessed it, puppy). The dogs are beagles and look fairly normal in daylight, but when darkness falls and the ultraviolet light comes out, they glow red. What’s significant in this work is not the dogs expressing red colours but that we planted genes into them. Glowing animals have been all the rage in recent years, with scientists creating glowing pigs and mice in the past. This South Korean experiment represents the first time that dogs have been made to glow in the dark. 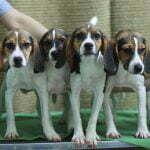 The cloned dogs were made by using skin cells from a beagle, which were then inserted with fluorescent genes and implanted into eggs. 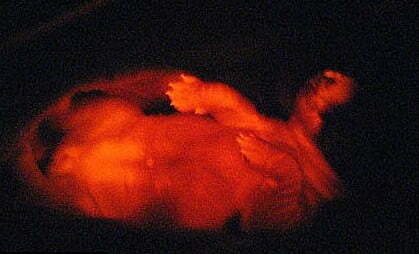 The eggs were then placed in the womb of the mother. The mother gave birth to six glow in the dark beagles in 2007, but two of the puppies died shortly after. Far from just producing glowing dogs, what the experiment has shown is that cells can be implanted with specific traits, which can then be used to produce cures for diseases. Unfortunately, as well as the ‘glowing gene’ the scientists are also experimenting with human diseases and dogs, which is something that won’t win them any favours in the western world, even if they do manage to find a cure for Parkinson’s, as they are hoping. How do you feel about dogs being used in this way? Do you consider this to be cruel, or a necessary step towards a scientific breakthrough? 9/11 police dog cloned: is it right? Do you have to shine an ultraviolet light on them to get them to glow in the dark,? or do they glow by themselves????? Read the article!!! It says visible to the naked eye!! !They glow red on their own!!! Stem cell is research is good for people… but this is overstepping the boundaries of what is right and normal. What’s next choosing the race of your children? This is unethical in my opinion. Mac: The article states UV light is needed and nowhere does it say visible to the naked eye. Greg: You re-read the article before commenting. Elise and Joe: This isn’t stem cell research, and what if this lead to humans having a resistance or immunity to cancer or AIDS? South Korea: Leading the world in useless technology for profit while other nations spend their money on research to battle to end AIDS, Cancer, Multiple Sclerosis and other pressing universal problems. That entire bit about hoping for a breakthrough was merely added on later when the scientists realized there would be a backlash in almost every country other than their own. This is the same university (Seoul National, supposedly Korea’s “best”) which produced the scientist who began cloning dogs to sell to rich americans two years ago.
. The dogs are beagles and look fairly normal in daylight, but when darkness falls “””””””and the ultraviolet light comes out””””””, they glow red. so you read and be nice! I LVOOOOOOE dgos, dno’t get me wnrog, but if it dseon’t hrut the amnail and it can hlep in mdceail rcaeersh, why not? Teerh’s no hram dnoe. (I LOOOOOOVE dogs, don’t get me wrong, but if it doesn’t hurt the animal and it can help in medical research, why not? There’s no harm done. I don’t care about making a dog glowin the dark. Its amazing that medical tech’s can do this. It is an important key to our survival. I “think” that if the animal(people are animals) aren’t physically abused in researching medical solutions to cure disease’s that kill hundreds of thousands, then by all means, do it. Nobody is god, nobody is playing god. If anything god created the disease’s we die from. So stop his will. Ethics? Define ethics. Ethics are a point of view from which you were raised, and where you came from. Research more and more. Sociopaths & Masochists are actually paid to perform on those who can not defend themselves, the most evil and wicked “experiments” imaginable. Dr. Evil said it best: You know, I have one simple request. And that is to have sharks with frickin’ laser beams attached to their heads! Now evidently my cycloptic colleague informs me that that cannot be done. Ah, would you remind me what I pay you people for, honestly? Cute little glow-in-the-dark puppies!? Throw me a bone here! I think this is awful – I’m sure they have not considered the pain and/or discomfort this has no doubt caused during trials. 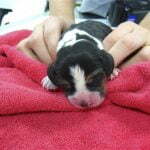 Korea is not known for its kindness to animals (I think they still have dogs on the menu) – this is very upsetting particularly as I am the lucky owner of a beautiful beagle who is lucky he was not born in Korea!!! How do they sleep at night? The dogs, I mean. I find it interesting when people portend to understand ‘what God wants’. How the hell do you know what God wants? You’re such good friends, golf on Saturdays? You’re an arrogant a-hole if you even think for a SECOND that God wants / doesn’t want something. Have you even considered that ‘God’ wants us to develop to the point where we can heal ourselves and be self sufficient? To experiment and gain knowledge enough to push the envelope of creation? To reach the stars? Nobody made you a messenger of God’s vision for our development as a species, so you just need to shut up. This is, as predviously said, playing god and is an abomination. Genetic engineering, even on animals, is completely imoral. It’s rediculous, Why bother? Not like your going to lose your dog in your house at night, it looks slightly fake though. I just don’t understand the whole point, yet people are going to buy them, and breed them. Who know’s what they would end up like..
Korea, Korea.. Love of dogs? What is this! i want one, how much are they? i think yes it is not right for these… ppl to do that 1 because they are playing god on dogs and if you think about that dog is god even if i dont really think there is one. and 2 these new dogs wil only live for half the time as the mom dog and will most likely not be able to have kids because of what they did to them. even if this will help us we dont need it. we were ment to live for so long and thats all if you die you die you dont come back as your self and that is what these ppl are going to do. if not today tomorrow. thats all i have to say about it. What will those crazy Koreans think of next? How about cloning a dog that won’t go on my lawn! I think it looks really nice, but i would NOT ever buy one who was bred for me, if it was out there looking for a homes, and it would fit into my lifestyle with my six dogs (and at least a hundred other animals) then sure, but i think it was a complete waste of time. And i also think that when they (not just koreans, people in general) make the dogs smoke in the labs, and rats eat poisen, should all be put in a giant oven, and the heat turned on so so incredibly low that it takes them a months to die of the heat. Which is, sadly, inmpossible. I dont care if it ‘helps humans’ i would rather die than be saved of cancer, or one of the other deseises hlped with the cruelty to animals. LOL Seth, that was funny. And yes, they are real. I’d quite like Glow-in-the-dark rats, because i breed mine, but i wouldn’t buy one, as with the dogs. The dogs fluoresce in the presence of UV light because genes were that coded for this phenomenon were implanted into their cells and expressed as the dogs developed. Obviously, the conclusions of this research were not simply of cosmetic significance. The scientists responsible for this experiment have a bigger objective in mind. According to MSNBC, this scientifc team has started to implant human disease-related genes in the course of dog cloning, and this could be applied to finding treatmets for genetic diseases like Parkinson’s. I just want to put in my thoughts before we write this off as nothing but a pointless endeavor that is cruel to animals. These Bealges are model organisms for applications that could be potentially used to save the lives of people with incurable conditions, like Parkinson’s. 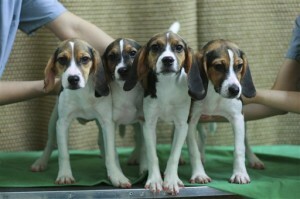 The dogs seemed like happy, normal beagles in all of the videos about this news development. 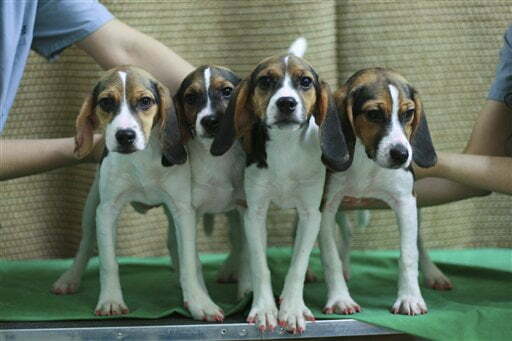 They were romping around happily just like any other beagle would be, and the korean researchers were lovingly petting them just like any other pet owner would have done. Maybe this is acceptable research, there was no evidence that the dogs were mistreated. If they had genetically engineered an animal that wasn’t as cute, such as a chicken or a donkey, would there have been the same responses? Just a thought. If a loved one in your family had a terrible disease (like Parkinson’s) and this type of research collectively helped to cure this invidual in your family, would you feel the same? Would you consider this research the same as playing God if its applications saved your spouse’s or child’s life a decade down the road? I don’t think these developments are as one-dimensional as they seem.